If there’s one thing that keeps a business in the black (profit) it’s innovation. It seems counter-productive to do something different but the reality is that there can only be a few successful copy cats out there and their life span is very limited. My experience shopping in New York is a great example of this. Do you remember bootleg CDs and DVDs, or knock-off purses and watches? When I first moved to New York you could find “good looking” fakes everywhere. I always thought the real thing was better than the imitation, but there was enough of a market to keep the imitators in business… until there wasn’t. Is the greatest form of flattery imitation, or is it the kiss of death? What got me thinking about this so much lately is the increasing number of copy cats I’m seeing on the market. There are two distinct ways I’ve been seeing this: At events and in marketing. Now, obviously there are some fundamentals that need to be done in every business operation. That’s not what I’m talking about here. Today I’m specifically talking about the copy cat formula that is being washed, rinsed and repeated without any adjustment or alteration for the user. Rather than give you a laundry list of what everyone is copying and how stale and boring it has become I’d like to give you inspiration. You see, I believe the greatest form of flattery is INSPIRATION, not imitation. Here are 2 examples I’ve experienced recently that point to how successful innovation can be, and how refreshing and exciting it is to deliver something unexpected and out of the ordinary. 1) Total absorption: Let’s discuss House of Cards. Netflix released House of Cards in February 2013 and released all 13 episodes at once. In addition to it being a web-only series, it was also the first time all episodes of a show were available at once. It was a gamble. It was risky. And people loved it. They closed their doors for the weekend, cancelled dinner dates and lost sleep to absorb every episode one after the other. How to use this: Do you have ideas about a product or service that defies the usual distribution rules? Take the time to do your research, see if a market is there and outline a new vision for your success. It’s a gamble, but one that can pay off ten fold. 2) Collaborate, don’t compete: Back in January I attended a livestream event by a woman named Sage Lavine. It was called Unite 2014 and what I loved about this virtual event was that she broke the formula. Instead of having her colleagues to hop on a call or webcast with her to deliver new year inspiration insights she had them hop on a plane! From one room viewers from across the globe were able to watch 6 powerful women in business share their struggles, triumphs, tactics and vision with the rest of us. How to use this: If time and space were bent for you, what outrageous action would you take? What have you envisioned to do that hasn’t been done before? Now, how can you partner with others to make the vision a reality? With the two examples above are you juices flowing? 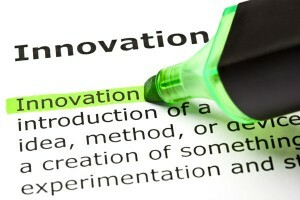 What ideas come to you as you think of simple ways that you can innovate in your own business? Share them with a comment below.